Congrats on the grand opening. Full press release can be seen below. 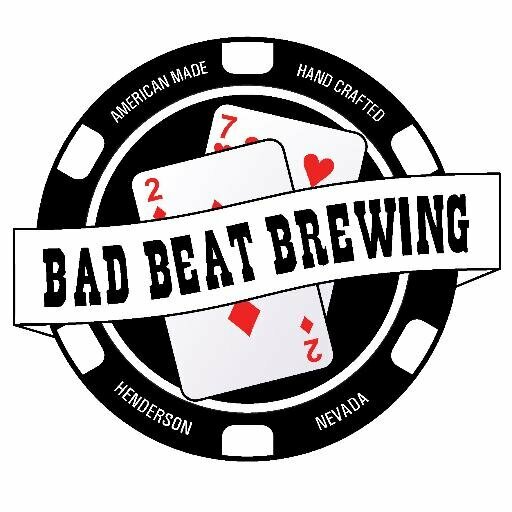 Bad Beat Brewing will open its doors to the public for their grand opening on July 11th, 2014 as Henderson and the Booze District’s first brewery and taproom. They are a poker themed microbrewery looking to add some new flavor to the Nevada beer scene. The grand opening event will kick off with a ribbon cutting ceremony at 5pm with doors opening immediately afterwards to everyone 21 years of age and older. At Bad Beat Brewing you can enjoy freshly brewed pints while playing shuffleboard, darts, regular nintendo, and even Cards Against Humanity. If you can’t commit to just a single pint, they will offer individual tasters (5oz) and beer flights that come with 5 tasters. If you want to take some beer home, bottles will be available along with growler fills. You can either purchase a Bad Beat growler or bring in one of your own for a refill. Food will not be served on site but they will have multiple food trucks from 7pm-10pm opening weekend and at least one food truck during regular business hours afterwards. During opening weekend Bad Beat Brewing will be rolling out their rewards program called “The High Roller Society.” Society benefits include discounts on pints, bottles, growlers, merchandise and much more! The first year membership will be discounted during opening weekend but membership is very limited and based on first come first served. Please visit the taproom for more details. Nathan and Sara Hall are both founders and co-owners of Bad Beat Brewing, who are “very proud to be 100% family owned with no outside investors or bank loans.” Instead of going the traditional route of funding through investors, banks, or even the not so traditional crowd-funding, the Hall’s decided to sell their house and invest all their savings into their dream. They said, “We didn’t want to look back and regret this once in a lifetime opportunity so we went all in….. literally!” Combining their two passions of poker and craft beer, Bad Beat Brewing was born. Head Brewer responsibilities will fall on Weston Barkley’s shoulders. Standing at 6’7” we know that won’t be a problem. Often referred to as “two brewers in one,” not only because of his size, but more importantly his dedication to the craft and great work ethic. You will be able to see him hard at work in the brewery from the windows of the shuffleboard room. Mike Dominiak will take on a general manager role as the Director of Imbibing Operations. If it involves drinking, like where to drink, what to drink, and when to drink, Mike will let you know through Bad Beat’s social media pages. He also will be running around town doing sales so you’ll be able to enjoy a Bad Beat Brew in your favorite bar. After all that, you will be able to find him pouring pints at the taproom most nights. Bad Beat Brewing is very excited to join the already great beer community in Henderson and Las Vegas. “We can’t wait to put our stamp on the craft beer community,” says Owner Nathan Hall.